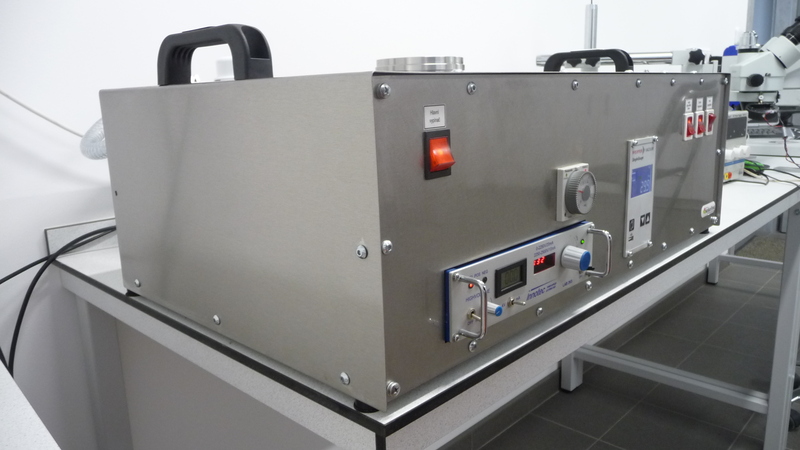 Equipment for optimal material structure visualization (enhancement of the dark areas and elimination of light areas and reflections mainly of surface layers or surface treated materials), visualization of material defects using optical microscopy. 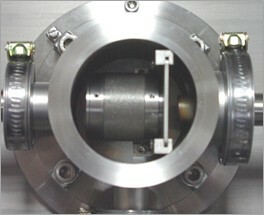 Sample encapsulated in thermo set resin DuroFast180°/325 bar/5 min., glazed using colloid silica, photo Leica DM 2500 (left side figure), deposited by FeO – 3 min. / 3 mA (right side figure). Benefit of application after sputtering visual in the area marked with arrows (click for zoom). 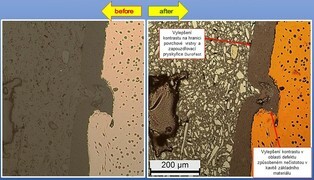 Fe3Al (experimental material developed and tested by Technical University in Liberec, (Mechanical Engineering faculty, Department of materials) – visualization of surface layer after nitrocarburising. 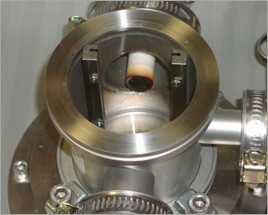 Sample encapsulated in thermo set resin with Cu filler, glazed using colloid silica, photo Leica DM 2500 (left side figure), deposited by FeO – 4 min./2,7 mA (right side figure). Benefit of application after sputtering visual in the area marked with arrows (click for zoom). 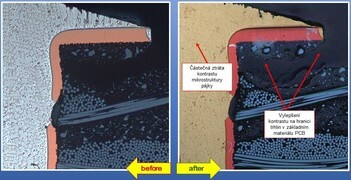 Sample encapsulated in thermo set resin EpoFix, glazed using colloid silica, photo Leica DM 2500 (left side figure), deposited by FeO – 5 min./1,7 mA (right side figure). Benefit of application after sputtering visual in the area marked with arrows (click for zoom). Sample encapsulated in thermo set resin DuroFast, glazed using colloid silica, photo Leica DM 2500 (left side figure), deposited by FeO – 3 min./3 mA (right side figure). 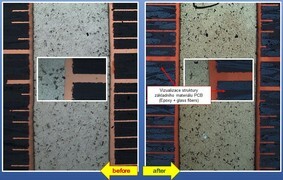 Benefit of application after sputtering visual in the area of the basic material (steel) mainly in different coloration of ferrite and pearlite (click for zoom). 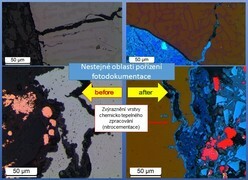 Sample encapsulated in thermo set resin EpoFix, glazed using colloid silica, photo Leica DM 2500 (left side figure), deposited by FeO – 4-5 min./2 mA (right side figure). Benefit of application after sputtering visual in the area marked with arrows (click for zoom). 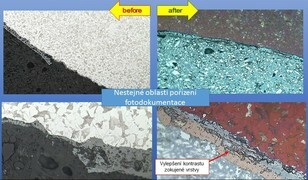 Sample encapsulated in thermo set resin Technovit 4001, glazed using colloid silica, photo Leica DM 2500 (left side figure), deposited by FeO – 3 min./3 mA (right side figure). Benefit of application after sputtering visual in the area marked with arrows (click for zoom). Sample encapsulated in thermo set resin DuroFast 180° / 325 bar / 5 min, glazed using colloid silica, photo Leica DM 2500 (left side figure), deposited by FeO – 3 min./3 mA 2x (right side figure). Benefit of application after sputtering visual in the area marked with arrows (click for zoom).